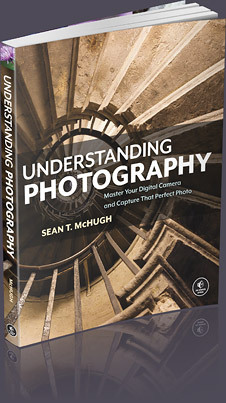 The continuous advance of digital camera technology can be quite confusing because new terms are constantly being introduced. This tutorial aims to clear up some of this digital pixel confusion — particularly for those who are either considering or have just purchased their first digital camera. Concepts such as sensor size, megapixels, dithering and print size are discussed. Every digital image consists of a fundamental small-scale descriptor: THE PIXEL, invented by combining the words "PICture ELement." 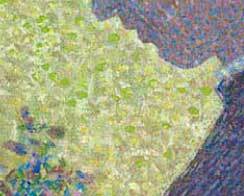 Just as how pointillist artwork uses a series of paint blotches, millions of pixels can also combine to create a detailed and seemingly continuous image. Each pixel contains a series of numbers which describe its color or intensity. The precision to which a pixel can specify color is called its bit or color depth. The more pixels your image contains, the more detail it has the ability to describe (although more pixels alone don't necessarily result in more detail; more on this later). Since a pixel is just a unit of information, it is useless for describing real-world prints — unless you also specify their size. The terms pixels per inch (PPI) and dots per inch (DPI) were both introduced to relate this theoretical pixel unit to real-world visual resolution. These terms are often inaccurately interchanged — misleading the user about a device's maximum print resolution (particularly with inkjet printers). "Pixels per inch" (PPI) is the more straightforward of the two terms. It describes just that: how many pixels an image contains per inch of distance (horizontally or vertically). PPI is also universal because it describes resolution in a way that doesn't vary from device to device. "Dots per inch" (DPI) may seem deceptively simple at first, but the complication arises because multiple dots are often needed to create a single pixel — and this varies from device to device. In other words, a given DPI does not always lead to the same resolution. Using multiple dots to create each pixel is a process called "dithering." Printers use dithering to create the appearance of more colors than they actually have. However, this trick comes at the expense of resolution, since dithering requires each pixel to be created from an even smaller pattern of dots. As a result, images will require more DPI than PPI in order to depict the same level of detail. In the above example, note how the dithered version is able to create the appearance of 128 pixel colors — even though it has far fewer dot colors (only 24). However, this result is only possible because each dot in the dithered image is much smaller than the pixels. The standard for prints done in a photo lab is about 300 PPI, but inkjet printers require several times this number of DPI (depending on the number of ink colors) for photographic quality. The required resolution also depends on the application; magazine and newspaper prints can get away with much less than 300 PPI. A "megapixel" is simply a million pixels. If you require a certain resolution of detail (PPI), then there is a maximum print size you can achieve for a given number of megapixels. The following chart gives the maximum print sizes for several common camera megapixels. 2 5.8" x 3.8" 8.7" x 5.8"
3 7.1" x 4.7" 10.6" x 7.1"
4 8.2" x 5.4" 12.2" x 8.2"
5 9.1" x 6.1" 13.7" x 9.1"
6 10.0" x 6.7" 15.0" x 10.0"
8 11.5" x 7.7" 17.3" x 11.5"
12 14.1" x 9.4" 21.2" x 14.1"
16 16.3" x 10.9" 24.5" x 16.3"
22 19.1" x 12.8" 28.7" x 19.1"
Note how a 2 megapixel camera cannot even make a standard 4x6 inch print at 300 PPI, whereas it requires a whopping 16 megapixels to make a 16x10 inch photo. This may be discouraging, but do not despair! Many will be happy with the sharpness provided by 200 PPI, although an even lower PPI may suffice if the viewing distance is large (see "Digital Photo Enlargement"). For example, most wall posters are often printed at less than 200 PPI, since it's assumed that you won't be inspecting them from 6 inches away. 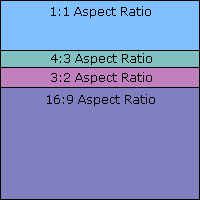 The print size calculations above assumed that the camera's aspect ratio, or ratio of longest to shortest dimension, is the standard 3:2 used for 35 mm cameras. In fact, most compact cameras, monitors and TV screens have a 4:3 aspect ratio, while most digital SLR cameras are 3:2. Many other types exist though: some high end film equipment even use a 1:1 square image, and DVD movies are an elongated 16:9 ratio. This means that if your camera uses a 4:3 aspect ratio, but you need a 4 x 6 inch (3:2) print, then some of your megapixels will be wasted (11%). This should be considered if your camera has a different ratio than the desired print dimensions. Pixels themselves can also have their own aspect ratio, although this is less common. Certain video standards and earlier Nikon cameras have pixels with skewed dimensions. Even if two cameras have the same number of pixels, it does not necessarily mean that the size of their pixels are also equal. The main distinguishing factor between a more expensive digital SLR and a compact camera is that the former has a much greater digital sensor area. This means that if both an SLR and a compact camera have the same number of pixels, the size of each pixel in the SLR camera will be much larger. Why does one care about how big the pixels are? 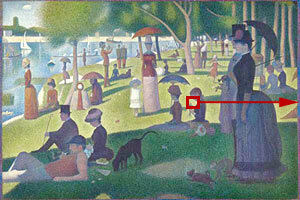 A larger pixel has more light-gathering area, which means the light signal is stronger over a given interval of time. This usually results in an improved signal to noise ratio (SNR), which createsa smoother and more detailed image. Furthermore, the dynamic range of the images (range of light to dark which the camera can capture without becoming either black or clipping highlights) also increases with larger pixels. This is because each pixel well can contain more photons before it fills up and becomes completely white. The diagram below illustrates the relative size of several standard sensor sizes on the market today. Most digital SLR's have either a 1.5X or 1.6X crop factor (compared to 35 mm film), although some high-end models actually have a digital sensor which has the same area as 35 mm. Sensor size labels given in inches do not reflect the actual diagonal size, but instead reflect the approximate diameter of the "imaging circle" (not fully utilized). Nevertheless, this number is in the specifications of most compact cameras. Why not just use the largest sensor possible? The main disadvantage of having a larger sensor is that they are much more expensive, so they are not always beneficial. Other factors are beyond the scope of this tutorial, however more can be read on the following points:larger sensors require smaller apertures in order to achieve the same depth of field, however they are also less susceptible to diffraction at a given aperture. 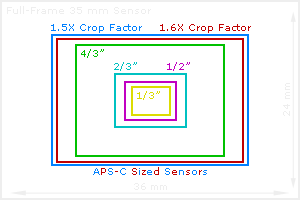 Does all this mean it is bad to squeeze more pixels into the same sensor area? This will usually produce more noise, but only when viewed at 100% on your computer monitor. In an actual print, the higher megapixel model's noise will be much more finely spaced — even though it appears noisier on screen (see "Image Noise: Frequency and Magnitude"). This advantage usually offsets any increase in noise when going to a larger megapixel model (with a few exceptions).